I will just point out a few areas that I think she could refine to improve this portrait. Sometimes putting a piece away for a bit as well and coming back will help you see issues that you were too close to see when you are working on a piece as often it is little discrepancies that throw off the likeness and are trickier to pin point. The proportions are very well done. I initially had thought the nostril and bridge on the right side of his nose was quite off but after measuring I realized the placement is actually very close and is just slightly off. The angle does need to be adjusted slightly, as indicated by the green lines on the Proportions image below. 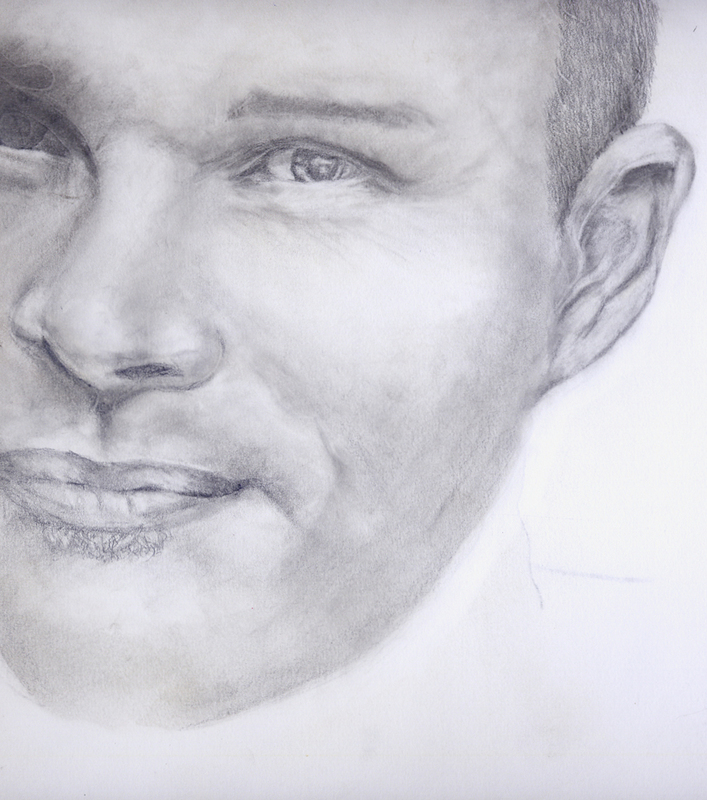 It is slight but makes a huge difference in capturing a likeness. The nostril is very light which draws the viewers eye instantly.As the shading is not progressively moving from dark to light as well, the shape is flattened rather than curved. Think of it like a sphere and how it would be shaded. The darkest value would be on the underside of the nostril would be lightest in the middle, slowly getting darker where the form turns and attaches to the face. Similar adjustments can be made to his mouth. His upper lip curves a touch more on his upper right lip and has a more concave curve on the left side. The cupids bow (area directly in the middle of his lips) has a much more pronounced curve the full width of the philtrum (area the lips & nose). In the drawing, the philtrum is shown as more of a dark line rather than a shape. 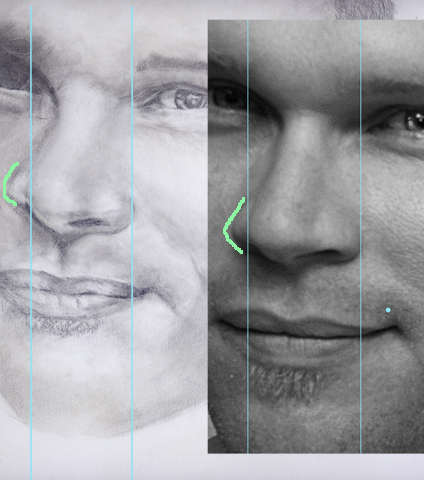 By further refining the curvature of the shape, more depth will be created and a better likeness achieved. If you look at the values image you can see that most of the drawing is around a level 4 (using a 20 value scale from light to dark) You could also use a scale from 1-10 or something similar. By increasing the range of values, you will be able to create much more believable form. The pupils, corners of the eyes, upper edges of the nostrils, lip line and the crease of the eye lid should all be between a value 17-20 to really create form and shape. 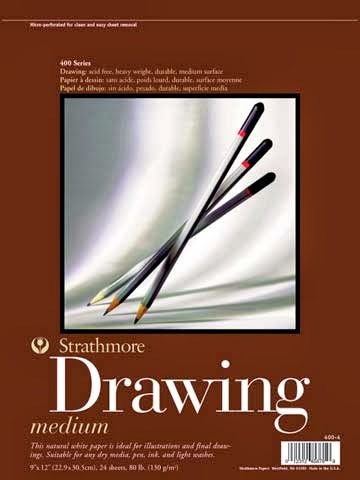 The values should be subtle and drawn as shapes rather than lines so that they read as shapes rather than cut out sections. 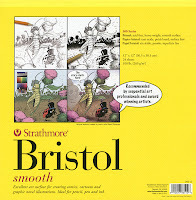 Blending between the values is easiest on a smooth paper such as bristol board. My favorite drawing surfaces are smooth or medium bristol board and arches hot pressed watercolor paper. The watercolor paper provides more tooth for the graphite and charcoal to settle into so it is great for artwork where more texture is required. 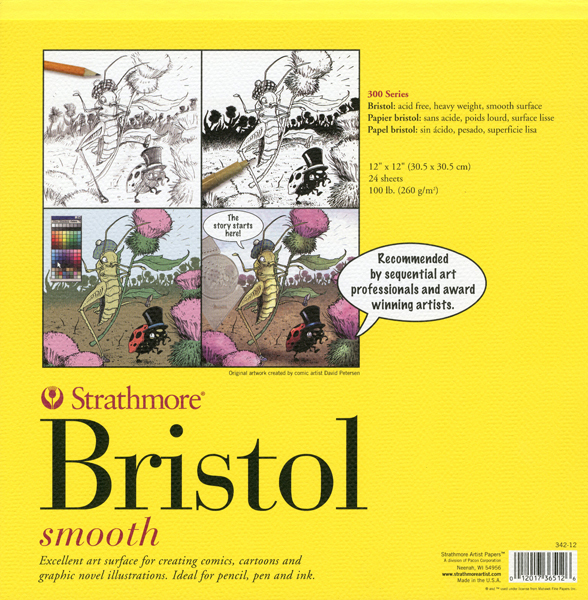 The bristol board is great especially when starting out as it can take alot of abuse from erasing and enables easier blending to achieve smooth values.